There is an important Swahili saying in East Africa that goes ‘Maji ni maisha’ which is loosely translated to “water is life” in English. Indeed, while this is a fact, the global truths remain that many communities in the world, particularly in the developing nations, have to manage stressful conditions due to acute water stress. , The UN Water Assessment Programme suggests that each person needs 20-50 litres of water a day to ensure their basic needs for drinking, cooking and cleaning. Recent statistics released by the WHO/UNICEF Joint Monitoring Programme for Water Supply and Sanitation (JMP), state:”11% of the global population, or 783 million people, are still without access to improved sources of drinking water”. The JMP reports every two years on progress towards the drinking-water and sanitation target under Millennium Development Goal 7, with a specific target number 10 which seeks to; “Halve, by 2015, the proportion of people without sustainable access to safe drinking water” between 1990 and 2015. The result is that water borne diseases such as diarrhea, which is the global leading cause of illness and death, continues to plague communities. This explains why, as a result of the Millennium Development Goals commitment, the world has witnessed sustained partnerships between key stakeholders, governments, development partners, donors and water practitioners aimed at tackling the problem of water stress. UNIDO is playing its role in ensuring that this global partnership succeeds to deliver positive results, even as 2015, the envisaged year when the MDG’s need to have been fully achieved, approaches. In transforming global policies to local tangible actions, UNIDO through a partnership with the Government of Slovenia supported the acquisition and installation of a water purification unit in Chipande - Matsangoni area, Kilifi County. The water project was designed in 2010 with the principal objective of contributing to an increase in the proportion of the population of the Watamu-Mida community with a clean and reliable supply of drinking water. UNIDO attracted support from the Slovenia Government, which donated water treatment equipment for water purification. This equipment comprises of a standalone mobile unit for water filtration, which uses reverse osmosis. In addition, this treatment plant can effectively operate in an area that is not connected to the electricity grid, since it is embedded with solar and wind energy technologies that can provide required power for the plant. 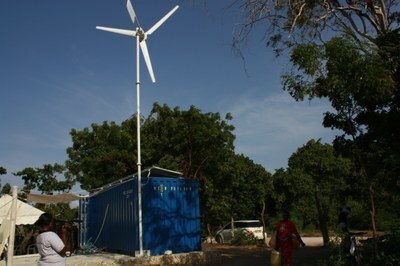 The water purification plant has since been installed, and was formally launched on 5th September, 2013. The plant is currently operational and is producing approximately 130 litres per hour of pure drinking water. 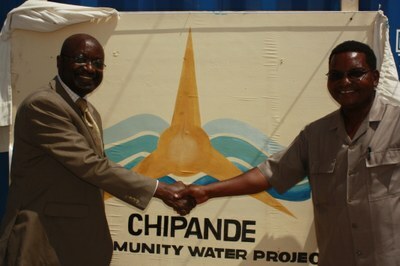 The formal launch of the Chipande Water Project was graced by the UNIDO Representative for Kenya and Eritrea, Dr. Mpoko Bokanga and the Kilifi County – Director of Water Services, Mr. Thomas M. Makanga. The launch was attended by a large number of people including; local authority representatives (one Chief and three Sub-Chiefs) two local schools (Chipande Primary School and Soyosoyo Primary School), as well as a number of headmasters and teachers from neighboring schools. Local community households were also strongly represented at the function. In his formal launch address, Dr. Mpoko Bokanga reiterated the importance of water to the community, and encouraged all the stakeholders, including the new County Government of Kilifi, to ensure this project was sustainable and beneficial in both the short and long run. Dr. Bokanga further emphasized the need for the local community to “take full ownership of the project’ and ensure that the project was a model of success. In his statement, the Kilifi County Representative, Mr. Thomas M. Makanga appreciated the good stewardship exhibited by UNIDO in this project, and committed further support from the Government to ensure the project was beneficial to the local community. He expressed Kilifi County’s interest in replication of such projects as useful models to enhance access of clean pure water for local use, especially for public schools, and as an avenue for creating sustainable employment opportunities to the unemployed locals. It is important to reiterate here that the launch of the UNIDO supported Chipande Water Project in Kilifi County in September this year, was not an end in itself, but just the beginning of a journey. As the Chipande Community Water Project Committee, led by Mr. Haroon Papu – a hotelier in the area – sets out to manage the facility and ensure it is productive and beneficial, it is clear that this water purification project is a useful best practice pilot that can demonstrate how a water community project can be sustainably managed. It is with this in mind that the local Committee is sourcing for partnerships with private sector players in the tourism rich belt of Watamu Mida Creek for the purified water to be packaged and sold to these establishments at an affordable rate. In this way, the project will generate sufficient revenues that will be injected back to the project, and thereby evolve into a sustainable model.